In a medium saucepan, heat the tablespoon of oil over medium heat. Add the onions and chopped jalapeño, and sauté until just tender. Add the minced garlic and continue to sauté for about one minute. Turn off the heat. In a large stock pot, combine the chicken stock, onion and jalapeño mix, tomatoes, beans, and corn, and bring the ingredients to a boil. Reduce the heat to a simmer, and add the chicken breasts to the pot. Cook for about 20 minutes, and then remove the chicken and shred it. Return the chicken to the pot, and stir in the chili seasoning, salt, and pepper. Simmer for 15 to 20 minutes, and then stir in the cilantro, turn off the heat, and let the soup sit while you prepare the tortilla strips. Cut each tortilla in half, and then cut each half into 1/2-inch wide strips. Spray a baking sheet lightly with non-stick cooking spray, and spread the strips out on top. Sprinkle the strips with the chili seasoning, and bake them until they're crisp but not burnt, about 10 minutes. 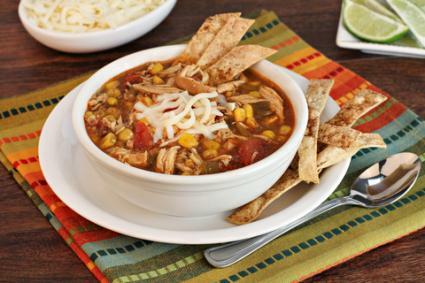 Ladle the soup into bowls, and top with tortilla strips and shredded cheese. Squeeze a wedge of lime over the top of the soup for additional flavor. Round out the meal by serving homemade cornbread on the side.